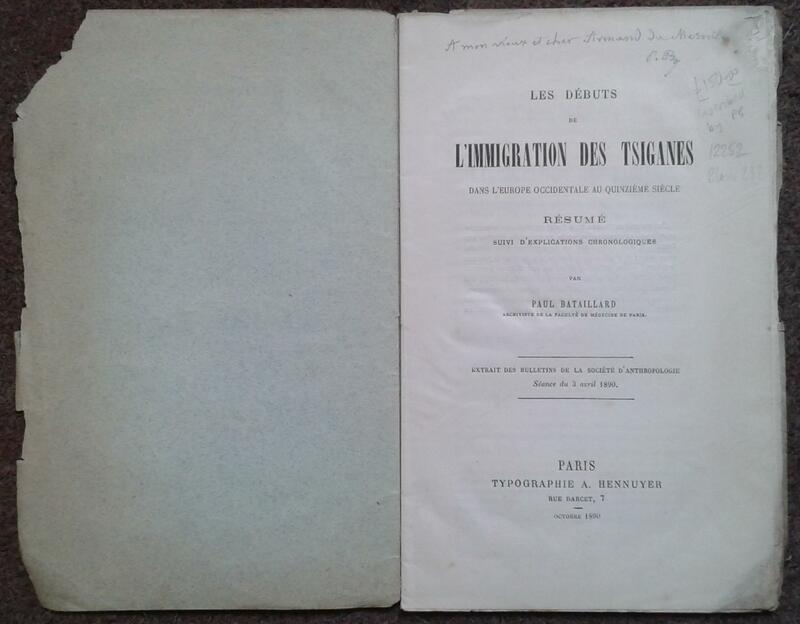 viaLibri ~ LES DEBUTS DE L'IMMIGRATION DES TSIGANES DANS L'EUROPE OCCIDENTALE AU QUINZIEME SIECLE RESUME SUIVI D?ÄôEXPLICATIONS CHRONOLOGIQUES. EXTRAITS DES BULLETINS DE LA SOCIETE D'ANTHROPOLOGIE SEANCE DU 3 AVRIL 1890. LES DEBUTS DE L'IMMIGRATION DES TSIGANES DANS L'EUROPE OCCIDENTALE AU QUINZIEME SIECLE RESUME SUIVI D?ÄôEXPLICATIONS CHRONOLOGIQUES. EXTRAITS DES BULLETINS DE LA SOCIETE D'ANTHROPOLOGIE SEANCE DU 3 AVRIL 1890. 1890 - Octobre, Paris, Typographie A. Hennuyer, pp31 + (i). some pages uncut, wrappers. Inscribed by the author. Black 232. Wrappers chipped, title page slightly chipped on one corner, otherwise good.